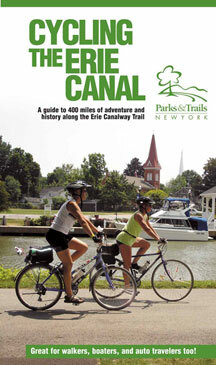 The outstanding bicycling and sightseeing waiting for visitors along the legendary Erie Canal is highlighted in the newly revised edition of Cycling the Erie Canal: A guide to 400 miles of adventure and history along the Erie Canalway Trail. The book, which features new sections of trail and up-to-date listings of lodging, bike shops, and other services, is published by Parks & Trails New York (PTNY), the statewide non-profit parks and trails advocacy organization. Cycling the Erie Canal is a key resource for cyclists planning to bike the entire 400-mile route as well as for riders looking to enjoy an afternoon of fun and natural beauty. It is also useful for walkers, hikers, in-line skaters, boaters, and auto travelers who want to enjoy the trail and some of the historic and cultural sights along the route. The 144-page guidebook includes 42 easy-to-read, full-color maps that detail the trail route, as well as the things to see and do along the way. In addition to parks, museums, historic sites, and visitor centers, the maps indicate lodging and bike shops. Services such as restaurants, convenience stores, ATMs, pharmacies, post offices, hardware stores, and parking areas are also shown. Cycling the Erie Canal includes interpretive information about the history of the canal, plus tips on cycling, travel, and trip preparation. With more than 100 color photos, the engaging guide features high-quality spiral binding. Its convenient 5” by 9” size is just right to tuck into a saddle bag, backpack, or glove compartment. The 400-mile Erie Canalway Trail route runs east-west between Buffalo and Albany in upstate New York. It follows both active and historic sections of the Erie Canal, the renowned inland waterway that opened the frontier of the fledgling United States to settlement and commerce, transforming the nation in the process. The guidebook is the outgrowth of Parks & Trails New York’s many years of involvement with the Canalway Trail. PTNY runs an annual cross-state bicycle ride along the Erie Canal which draws 500 participants from across New York, the U.S. and the world. “Over the years, more and more requests have come in from cyclists who want to ride the route on their own and are looking for a resource to show them what to see and do along the way, where to find a B&B, and how to locate a bike shop, pharmacy, or ATM. Cycling the Erie Canal provides this critical information,” says Robin Dropkin, Executive Director of Parks & Trails New York and co-author of the guidebook. Cycling the Erie Canal retails for $23.95. Parks & Trails New York members enjoy a special discount price. It is available from Parks & Trails New York by visiting the Parks & Trails New York website at www.ptny.org or calling 518-434-1583. The guide is also available at bookstores, bike shops and museum and gift shops. 0 Comments to "New 'Cycling the Erie Canal' Guide"